I’ve written in the past about having a more environmentally friendly Easter. The basics are pretty simple – reuse baskets and other supplies where possible, buy less stuff, don’t buy plastic if you can help it. Here are some more ideas you may not have considered. Rather than give more stuff, print up coupons for activities you will do with your kids, such as a picnic outside, a trip to the park, playing a game together, things like that. Are you creative? Make a toy for your child. Sewing, knitting, woodworking, if you have the skill to make something, why not? Got a bunch of old, broken crayons around the house. Many families do. Rather than toss them, put them into molds and make new crayons for your kids’ Easter baskets. With all the candy most of us cannot resist giving, add in some outdoor toys and sports equipment to encourage the kids to get out and play. 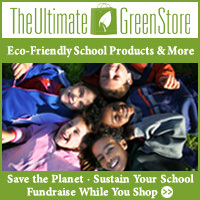 Overall, the biggest challenge to having an eco friendly Easter is our own habits. I always have trouble resisting the Easter candy aisle at the store this time of year… some of my favorites are only in stores this time of year. While I don’t resist them entirely, I use ideas such as the above to cut down on the bad stuff while still giving really fun Easter baskets to my kids. 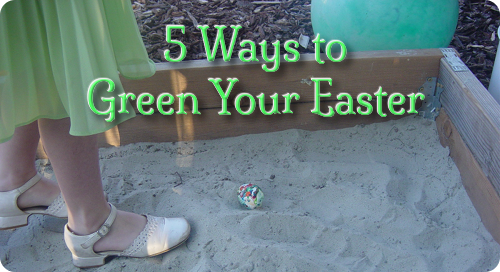 Egg hunts are fun for the kids (and often the parents), but why limit yourself to just eggs? You can hide money or clues for the kids to seek out also. You can even hide silly activities for the kids to do, such as walk backwards to the next clue, hop on one foot, pet the dog, and so forth. Have fun with it all. Published by Stephanie, in Eco Friendly Parenting. Tagged with easter, egg hunt, holidays.